All fans are induced-draft axiall type with adjustable pitch. Material chosen are n o n - corrosive plastic, FRP or aluminum alloy . The high efficient design ensures low running cost and low noise level. All fans are well balanced & pre-set at factory. The motors are TEFC weather proof type, specially designed for Ryowo, and suitable for 380V/3/50Hz. Up to and including 4 Kw, motors can be D.O.L. started, and 5.5 Kw and above are star-delta started. The fans for smaller models are designed to be direct-driven by low speed motor of 6, 8, 10 or 12 poles. For larger models, the fans are vee-belt or gear driven with 4 poles motors to enable the speed of fans to be adjustable to suit various applications. 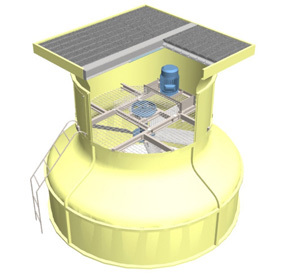 Automatic rotating sprinkler system with rotary head and sprinkler pipes distributes the hot water evenly by over the entire top layer of the filler. Sprinkler pipes are n o n -clogging, require low re-action force to rotate, and assure uniform water distribution with minimal operating pump head. The F.R.P. eliminators attached to sprinkler pipes are specifically designed for low pressure drop and minimizes water being carried over. F.R.P. (Fibreglass Reinforced Polyester) formed casings are durable, non-corrosive, weather-proof, and light weight. 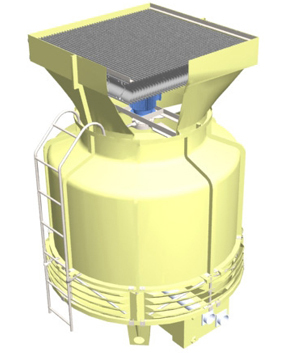 Cylindrical form is shaped to fully withstand wind pressure, vibration and such. F.R.P. casings obviate the need for painting, reduce maintenance costs and guarantee long reliable service. Bowl-shape basins are also made from F.R.P. with built in socket or flanged outlets for piping connections. For larger models, a F.R.P. auxiliary suction tanks are employed in the centre and fitted with piping flanges or sockets. All supporting steel members are hot-dip galvanized to minimize rusting and corrosion thus ensure long service life even in corrosive atmosphere. Stainless steel hardware members are also available upon request. High performance RYOWO V-30 film filler is the heart of the tower. The specially formed PVC sheets maximize the air/water contact areas and minimize air pressure drop to assure efficient heat transfer while keeping fan motor power low. It is virtually immune to corrosion and decay. Specially designed noise absorbing nylon splash mat is provided on the water basin for low noise models to minimise the unpleasant water dripping noise. Drift eliminations formed of polyvinyl chloride (PVC) are equipped to the cooling tower to prevent the water droplets from escaping in the exhaust air stream, maintaining a drift loss of less than 0.001% of circulating water flow rate.